Research has proven that technology companies with successful services solutions and capabilities can increase revenues and profits, while delivering strategic benefits including greater client loyalty, higher levels of product pull-through and better new account penetration. Technology services providers including hardware and software companies, pure services providers, shared service and support organizations and outsourcing entities also know that efficient management of human capital is key to cost control and effective service delivery. 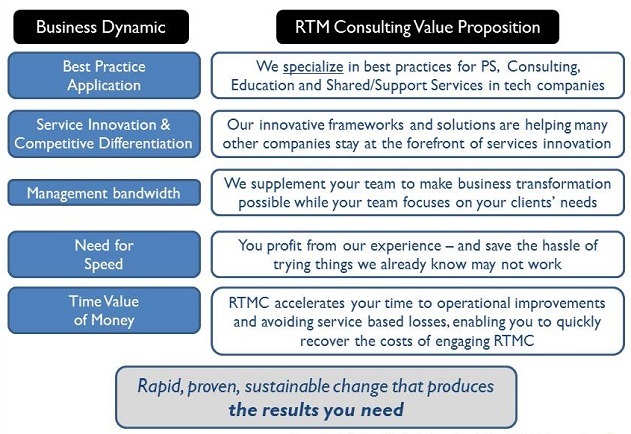 Specializing in Global Resource Management, Project and Portfolio Management and Services Business Optimization, RTM Consulting can help your technology services organization get better at what you do. Our deep expertise includes professional and consulting services, support and shared services. We also offer outsourcing advisory services to assist both providers and consumers of outsourcing services. Our unique Business Acceleration Services will help your company achieve its goals in the shortest possible period of time. True operational consulting will help your firm extract maximum value from your strategy, moving you beyond theory to practical application of industry best practices that produce results. Our unique Just-in-Time Resourcing® brand of human capital management solutions has become a powerful differentiator for many different types of service providers. And running a more efficient and competitive technology services practice is key to delivering real solutions. Contact us to learn more about how we can help accelerate your business!